Roughly a year ago, Awen began smacking me upside the head to do a series of paintings for the elements. (It’s true, sometimes Awen hurts.) I’ve obviously been sitting on this inspiration for a while now, but I think the brew’s been boiling for long enough. At the last full moon, I scoured the conservation land for as many different types of leaves as I could get my grubby little Ovate hands on. The results were: four types of oak (red, white, black, pin), American chestnut, staghorn sumac, hawthorn, striped and red maple, sassafras, fern, birch, and beech. I pressed them between the pages of the Oxford Classical Dictionary (yes, its abbreviation really is OCD) for two weeks while my brain played with the patterns. 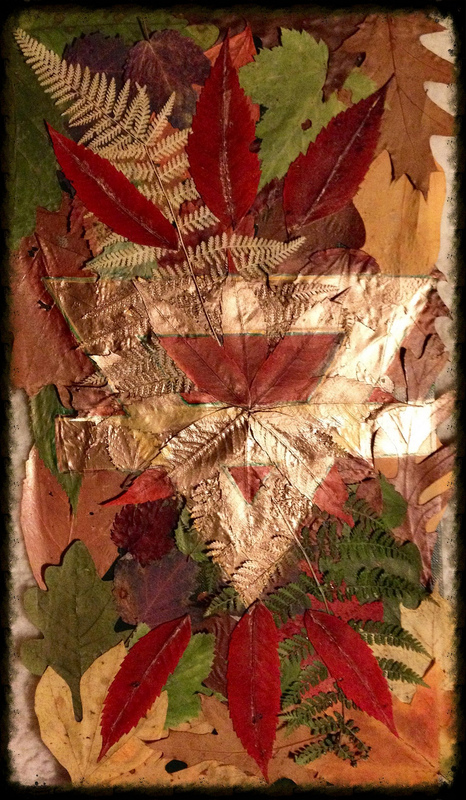 Finally, in a rare two hours of free time, I prepped the canvas board with acrylics and began arranging the leaves. Where they didn’t contact the wet paint directly, I used PVA glue to secure them. The next step was to fashion a stencil that could be used on all four paintings for the elemental symbols. Once it was in place, I used metallic gold spray paint to create the Earth motif. Finally I cleaned up the edges with various shades of Sharpie to make the gold really pop. This was the final result. 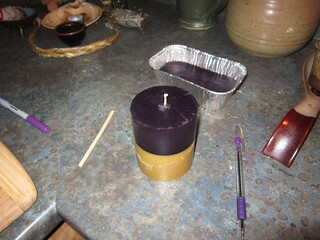 Candles are probably one of the easiest ritual tools to make. I also find them one of the most satisfying. Oddly enough, I’m only in the mood to make them in September and February, so I tend to go on a bit of a binge so that I have enough to get me through the rest of the year. Once you have yourself a nice little stash, the next step to to melt the wax, which is best done in a double-boiler over low heat. Yes, this way takes longer, but the risk of wax explosion/fire/other mayhem is much less. 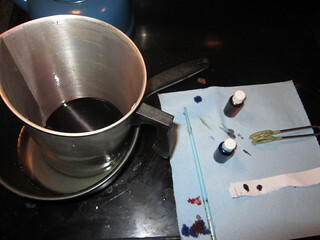 When everything is liquid, it’s time to add dye and/or fragrance as desired. Dye come in solid blocks or liquid form—I much prefer the latter as I feel it gives more control and deeper colors. You can color-test the wax by putting a teaspoonful on s sheet of white paper. This will give you a decent approximation of the final shade. Once the wax is melted and dyed, it is poured into a mould lightly coated with olive oil. I just learned the olive oil trick this year and boy has it helped! I used to spend a good deal of time cursing stuck candles, or worse, marring them with a hair dryer or hot water bath. Olive oil really saves you the trouble and keeps bits of wax from sticking to the inside of the mould. There are a number of different types of wicks, some stand alone, some needing to be tied off through a hole in the bottom of the mould. 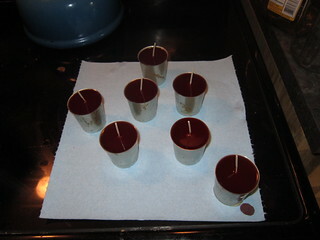 For votives, I do prefer the self-supporting wick, though these often have some sort of metal like zinc in the core. But for anything bigger, a large or extra-large braided cotton wick is my favorite. In my experience, all poured candles (as opposed to dipped ones) need to have a second or even third pouring after the initial ones have cooled. A well will develop around the wick as the wax shrinks and adheres to the sides of the mould. Simply use a chopstick or thin dowel to poke three to four holes into the soft wax to within an inch of the bottom of the mould; this will relieve the surface tension, so you can make a second pour to fill in the well. Once the candle has cooled and you’ve removed it from the mould (if if does get stuck, put it in the freezer for no more than 10 minutes and it should pop right out, especially if you’ve used olive oil), you can trim the seams and decorate it. This one got one of WillowCrow‘s necklaces to spruce it up a bit. 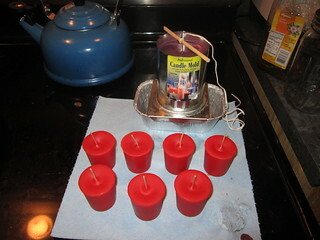 The next couple of shots show the process for votive candles. 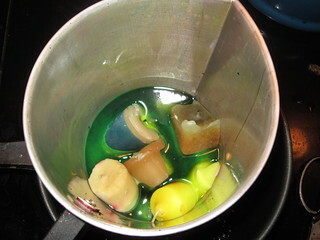 When melting wax, I try to keep the colors to one family, or at least to a secondary color and its two primaries (e.g. 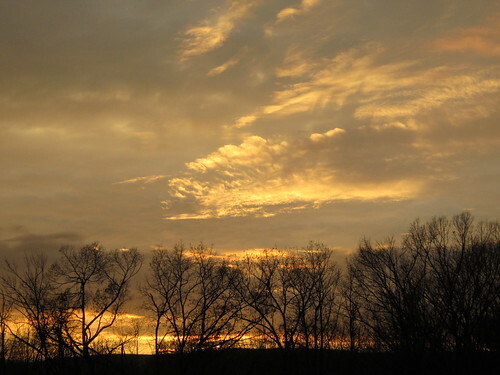 orange, red, and yellow)—otherwise, you end up with a lot of browns. These votives came out on the red-orange end of the spectrum (a shade I privately call Tequila Sunrise), and truthfully a bit more eye-searing than I would have liked. But they are relentlessly cheerful in the face of winer! Below you can see the difference between the self-supporting wicks (which tend to bed in larger candles) and the tensioned cotton wick, supported by half a chopstick. I actually managed to craft my way through my entire left-over wax stash this fall, as well as all my neighbors’ donations. 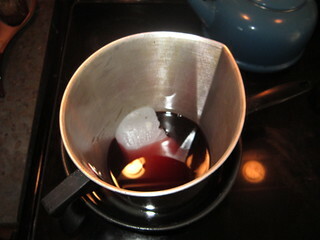 I still have a large block of paraffin left over, and probably six to eight pounds of beeswax. And hopfully my generous neighbors will have even more odds and ends for me in the spring. 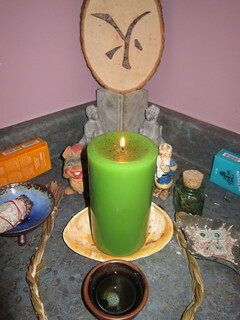 The last candle I made will be for Alban Eilir, since it reminds me of spring leaves. I also mixed in ashes from the Alban Elfed bonfires at the OBOD East Coast Gathering, which give it a nice symmetry in my mind. 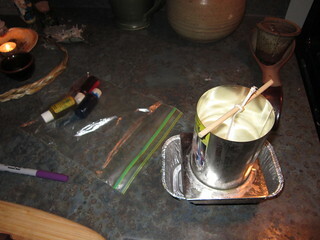 Candle making can be more than just a way to create nifty altar swag. It’s a way to live the ideal of reusing materials. It’s a way to connect with your neighbors and community. 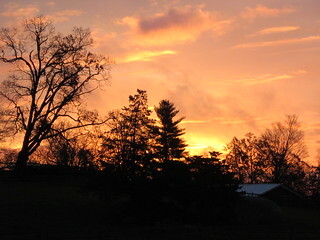 And it can also be a way to remember what our ancestors had to do in order to work past sunset on those long winter nights. And it’s an exercise in patience, meditation, and mindfulness, if we so choose. Yes, my eyes are closed. It was a meditation fer cryin’ out loud! The Gathering itself really hit its stride this year. It felt like the core group had really solidified, and that we were able to embrace guests and newcomers into our traditions. Now we were friends coming together, not just folks with similar interests seeking companionship. 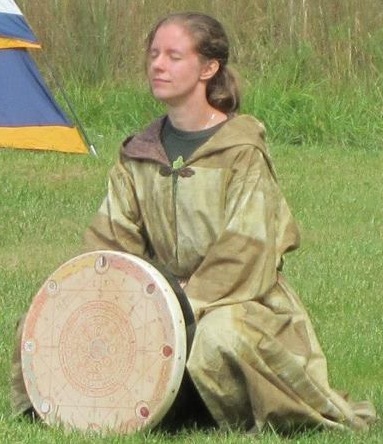 The two guest-speakers were Philip Carr-Gomm, the Chosen Chief of OBOD, and John Michael Greer, the Grand Arch-Druid of AODA. It has long been a wish of mine to put these two men in the same room and be a fly on the wall during any following conversations. I more than got my wish! Hopefully their open discussion will be broadcast on an upcoming episode of DruidCast (available free on iTunes). Both gentlemen were approachable, eager to answer questions, and had an amazing depth of knowledge across a variety of subjects. 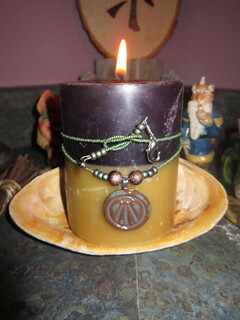 Beeswax equinox candle. It was supposed to be white and black, but yellow and purple seemed to work well enough! Necklace by Willowcrow. In fact, JMG was able to answer a question that had been bugging me for nearly five years, namely why did the Golden Dawn change the correspondences from the traditional Hellenic Elements (Earth/West, Water/North)—used from to what is so commonly used today in Neopagan circles (Earth/North, Water/West). It was apparently not, as some have suggested, a geographical change to better match Britain’s climate, but one based on the different elemental associations of the four Hebrew letters that comprised the name of god, Adonai. In hindsight it’s a little ridiculous how much this question was bothering me, but it’s so nice to have an answer other than “the Victorians are doin’ it wrong, again.” Now I feel like I can make an informed choice between the systems, and that’s a great weight relieved. Meditation beads for the Chosen Chief. We were then lucky enough to host the Carr-Gomms for our Alban Elued celebration back in Boston post-Gathering. We all brought gifts for a crane bag that we presented to the Chosen Chief and Scribe. 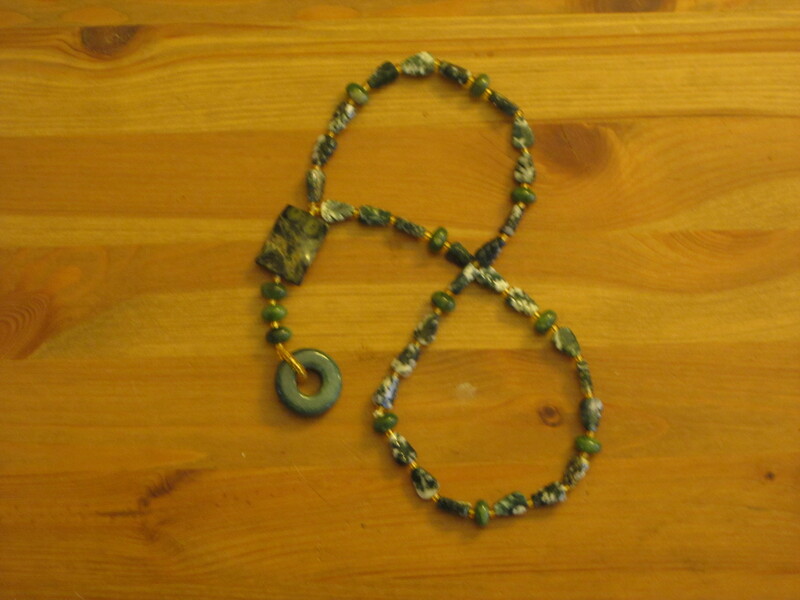 My contribution was a glass spiral pendant on a silver chain, and a set of meditation beads. Meanwhile, between these, my robes, and pouring a candle for the ritual, I feel like I’ve gotten my crafting groove back. 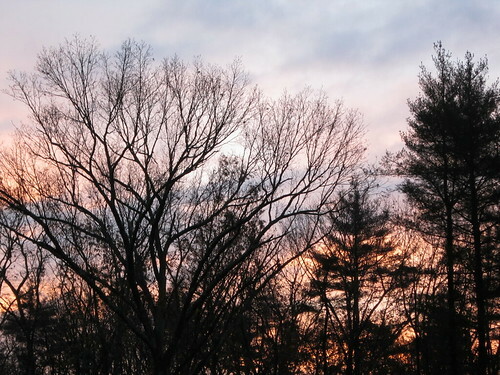 Fall is really a time of fruition in more ways than one for me; it feels like the long drought of summer has finally broken and awen is able to flow freely through me.